We distort reality when we omit the health and environmental costs associated with burning fossil fuels from their prices. When governments actually subsidize their use, they take the distortion even further. 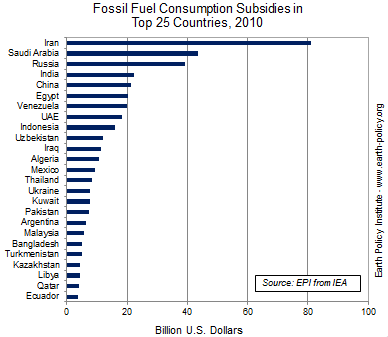 Worldwide, direct fossil fuel subsidies added up to roughly $500 billion in 2010. Of this, supports on the production side totaled some $100 billion. Supports for consumption exceeded $400 billion, with $193 billion for oil, $91 billion for natural gas, $3 billion for coal, and $122 billion spent subsidizing the use of fossil fuel-generated electricity. All together, governments are shelling out nearly $1.4 billion per day to further destabilize the earthâ€™s climate. The government of Iran spent the most on promoting fossil fuel consumption in 2010, doling out $81 billion in subsidies. This equaled more than 20 percent of the countryâ€™s gross domestic product. Saudi Arabia was a distant second at $44 billion. Rounding out the top five were Russia ($39 billion), India ($22 billion), and China ($21 billion). 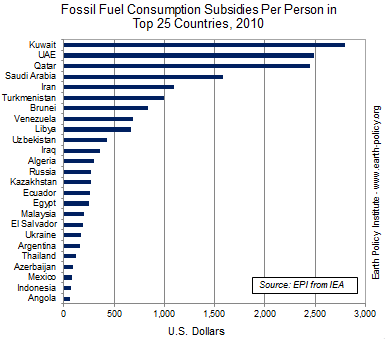 Kuwaitâ€™s fossil fuel subsidies were highest on a per capita basis, with $2,800 spent per person. The United Arab Emirates and Qatar followed, each spending close to $2,500 per person. In contrast to the $500 billion in fossil fuel supports in 2010, renewable energy received just $66 billion in subsidies -- two thirds for electricity generation from wind, biomass, and other sources, and one third for biofuels. Not only do fossil fuel subsidies dwarf those for renewables today, but a long legacy of governments propping up oil, coal, and natural gas has resulted in a very uneven energy playing field. A world facing economically disruptive climate change can no longer justify subsidies to expand the burning of coal and oil. The International Energy Agency projects that a phaseout of oil consumption subsidies by 2020 would cut oil use by 3.7 million barrels per day in that year. Eliminating all fossil fuel consumption subsidies by 2020 would cut global carbon emissions by nearly 5 percent while reducing government debt. Shifting subsidies to the development of climate-benign energy sources such as wind, solar, and geothermal power will help stabilize the earthâ€™s climate.